Which Western Caribbean Island Will You Visit Next? The western Caribbean islands are a heterogeneous (very diverse) set of islands (in both language and culture) that surround the vast western section of the Caribbean sea. 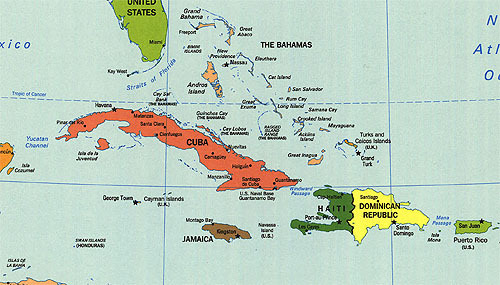 They consist of the Greater Antilles islands of Cuba, Jamaica, Hispanola (the Dominican Republic and Haiti) and Puerto Rico, The Bahamas, Turks and Caicos Islands, the Cayman Islands, the Florida Keys and Cozumel, Mexico. The cruise industry has really exploded in this section of the Caribbean. Because of the distance between these Caribbean islands, you will spend more time at sea on the ship that on eastern Caribbean cruises. Some people like this aspect (I occasionally enjoy a day relaxing on the decks of the ship, staring out over the beautiful salt water) while others do not (my wife prefers more ports of call, and the resulting shopping trips). Other than cruises, many people find the best way to experience the western Caribbean is in one of the many all-inclusive resorts that have homes here. the variety in cultures is apparent as soon as you hit land at any of these beautify locations. So which one will you choose? Take a look at these western Caribbean island maps and start planning your get away now!